If I had a dog it would definitely be a poodle – and not the mid size but a giant one – and trimmed to proud perfection. Alas, there’s no way I am going to have a dog: living in the city (by choice) and travelling very much (by duty and by choice), I would not be able to make any dog happy. And my husband also works long hours and travels. So, no poodle for us. 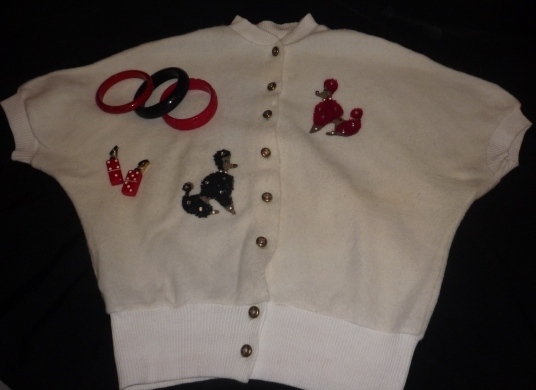 But I can still have – in a very 1950s way- poodles in my wardrobe. 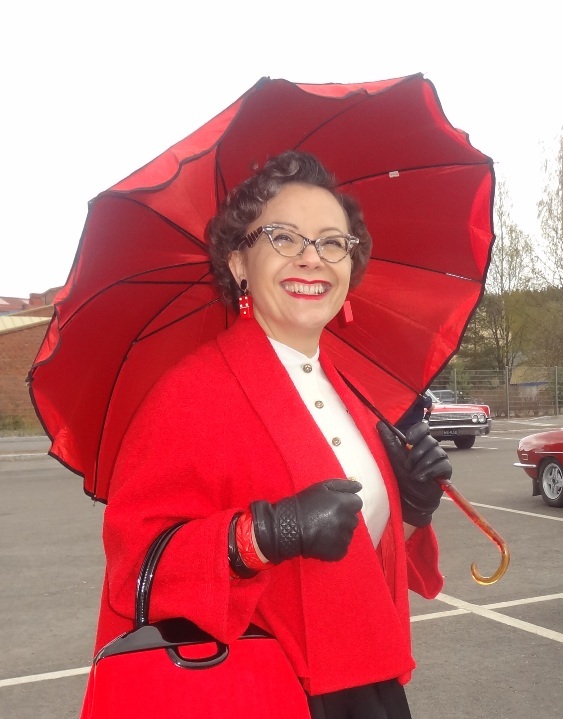 Like this white orlon fleece top, with a red and a black poodle, which I wore – paired with a black circle skirt and a red swing jacket – at the annual Classic Car Show in Lahti early May. I also had bakelite red and black bakelite bangles and earrings newly made out of vintage red bakelite dominos. Then the usual assorted accessories – in red and black. 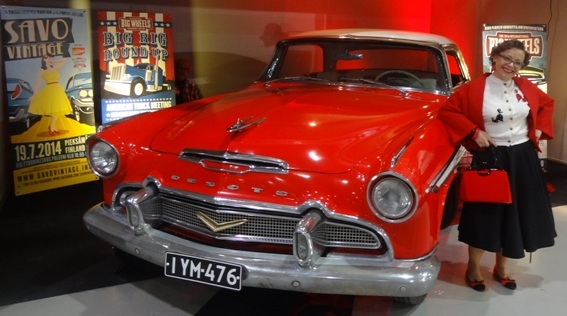 As a background for the pictures I tried to find red vintage cars and this gives me also the opportunity to mention that Savo vintage will be once again organised in Pieksämäki – Finland – on July 19th, jointly with the vintage car meeting. It’s really a nice summer event, by a lake. The weather was cold and rainy and even inside I kept my swing jacket all day. And outside had to use gloves and an umbrella. 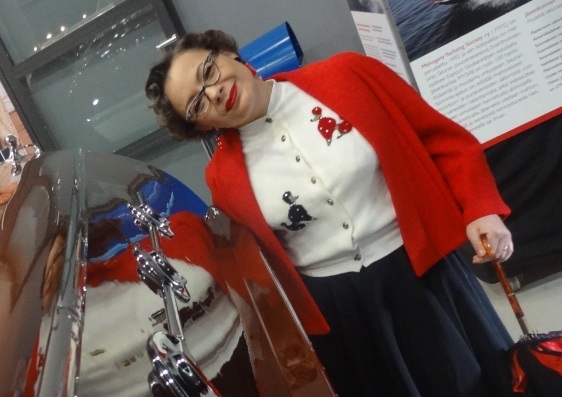 My top is from Debbie’s vintage stall at the Rockabilly Rave a year or two ago. My skirt is a present from a dear friend, back in 1988 or 89. 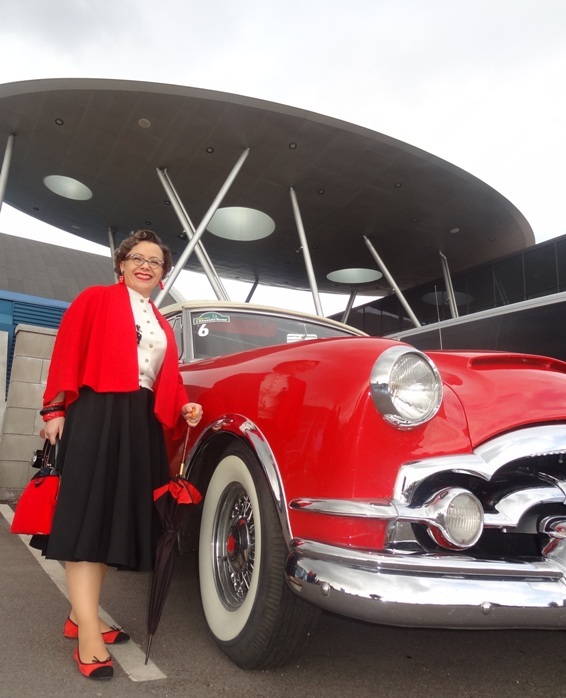 My red swing jacket is from Boss of Denver, at the very first Viva Las Vegas Weekender in 1998. My umbrella is from ebay, my purse from an Antique Mall in Fresno (or Clovis) California. My ballerinas and gloves are modern ones. My bangles are from different locations including the Long Beach flea market and an antique shop in Stockholm’s Sodermalm neighbourhood called ”Brand station”. My earrings are from a very nice vintage costume jewelry shop called ”Vingt sur Vingt” and located in the heart of Paris. 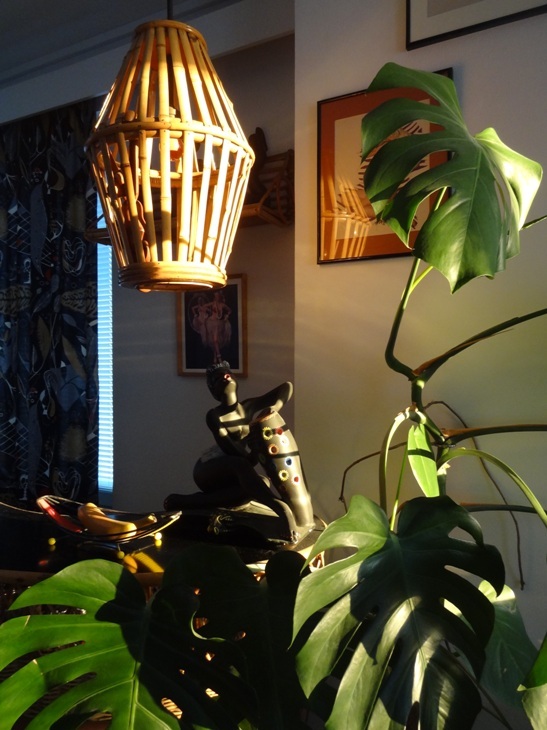 And last but not least, just a picture of another corner at home… our exotic corner in evening light. Uutistoimitus: Iki-ihana Tallipihan Suvi-Vintage tulee taas! Amazing top! I love a variety of 1950’s dog figures and decorations. Thanks! I also have a few home items with poodles but not that many actually. Thanks! I have to say it was a great find. Sylvie! You and your home look fabulous, as always! Thanks Shauna! I found this swing jacket years ago and I love it so much that I actually asked my friend Eija of VintagEija’s to make an exact copy of it in golden brown. So now I have two.